Not sure what equipment you need to get started in beekeeping? The number of choices in beekeeping catalogs can be overwhelming. Here are the basics. Have something you think should be added to the list? Contact webmaster@pcbeekeepers.org. To save money, people can make much of their own beekeeping equipment (e.g. entrance reducers) with many online sources for instructions. What type of protective clothing to wear is a personal preference. Beginners should always wear protection. Always protect your face. At minimum wear a bee veil. A bee jacket with attached hood is a good investment. A full length bee suit isn’t necessary if you wear pants and have long socks covering your ankles (pulled up over your pant leg bottoms). Gloves (soft goatskin) — Many beekeepers choose not to wear gloves. Smoker fuel and lighter (required) — No need to buy smoker fuel sold by bee supply stores. Newspaper, burlap, and some wood chips (Del’s/Tractor Supply Gem White Shavings Animal Bedding) or pine needles. See Renzy about burlap. Bee Brush (optional) — For brushing bees off clothing, hive body top edges when closing up the hive, or brushing bees off frames when harvesting honey. To save money, try using a goose or turkey feather instead; they don’t smear honey and get all gunked up and wind up with bees stuck on them. Clean Spray Bottle (optional) — For spraying sugar syrup when installing packages; also used for baiting new foundation. Note: Be sure to choose the correct equipment sizes for either deeps or mediums/westerns. Screened IPM Bottom Board — Alternative to a regular bottom board. Allows varroa mite inspections and increased hive ventilation. Mites fall through screen to ground. Costs between $1 to $10 more than a standard bottom board. There are screened bottom boards available that have a closure board so they can be used year round. Be sure to close up the Screened IPM Bottom Board during colder months to prevent chilled brood. Alternatively place a piece of plywood cut to the size of the ventilated bottom board underneath it during cold weather. Telescoping Outer Cover (required) — Flat roofs are both useful and practical versus the copper pointed roof decorative outer covers. 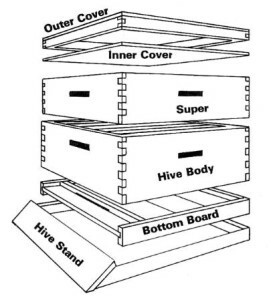 When working your hive, use the flat outer cover to place your hive bodies on top of to keep off ground. Weighted object (rocks or bricks) placed on top of outer cover to prevent wind from blowing cover off. Entrance Reducer (required) — You can also make your own. Hive Base — Something to keep hive off the ground. There are many ways to do this, such as four cinder blocks standing on end, with 4X4 pressure treated wood cut 4 feet long (an eight foot long 4X4X8 PT wood square post cut in half) per bee hive. NOTE: There are many hive systems to choose from. Four are listed below: Traditional Langstroth, All Mediums, All Deeps, and Top Bar Hive System. The hive system you choose is a personal choice. Deeps (minimum three): Two for the two lower brood chambers, plus a third deep box for placing over jar feeder as protection during spring and fall feeding of syrup and/or medication. Deep frames with foundation (10 frames for bottom brood box) plus buy 10 frames for the second brood box, but only use 8 or 9 frames in second box. This gives bees more room to build out comb and more space to move to prevent crowding, which leads to swarming. Mediums/Westerns (minimum two): Two or more as honey supers. Medium frames with foundation (10 frames per box) but only use 8 or 9 frames in each super box. This gives bees more room to build out comb and more space to move thus preventing crowding, which leads to swarming. Cons: Deep frames drawn out in comb cannot be moved up to honey supers to bait bees because of frame size difference. Two different box and frame sizes. Pros: Good for your back and for older or smaller beekeepers. Mediums are not as heavy to lift. Boxes Needed: 3 Mediums/Westerns for the brood chambers, plus 2 or more mediums for honey supers. Also need an extra box for protecting mason jar feeder. 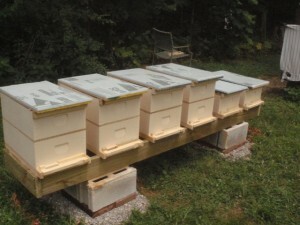 Frames Needed: Medium frames with foundation — 10 frames for each of the three bottom brood boxes, plus 9 frames for each of the honey super boxes. This gives bees more room to build out comb and more space to move thus preventing crowding, which leads to swarming. 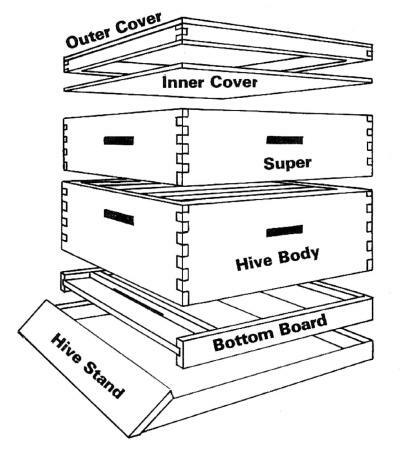 Overwintering: Use four boxes to overwinter your bees — the bottom two for brood and leave the top two full of honey. Similar to System 2, but using all deeps for hive bodies and honey supers. Uses all deep frames. Need: Two deeps for brood chambers, two deeps for honey supers, plus one deep for placing over jar feeder as protection during spring and fall feeding of syrup and/or medication. Deep frames with foundation (10 frames for bottom brood box) plus buy 10 frames for the second brood box and for each of the two honey deep supers. Use 8 or 9 frames in the second box and supers. This gives bees more room to build out comb and more space to move to prevent crowding, which leads to swarming. Total of 40 deep frames purchased. Pros: If you use deeps for the two brood chambers, using deeps for your honey supers allows you to move up frames from the hive bodies, which you can’t do in a traditional Langstroth setup due to box/frame size differences. Gives ample room for bees to help prevent swarming. Cons: Deep honey supers are very heavy. Hive height gets tall very fast. Use this system if your bees simply won’t use System 1’s Langstroth hive medium supers. Not generally recommended for beginners. Not taught in PCBA beginning class. Come view a top bar hive in the PCBA Apiary. Pros: Supposed to keep the queen in the lower two brood chambers so that she doesn’t lay eggs in the honey supers. Cons: Bees may not want to go through queen excluder, especially your first year, if you don’t have drawn comb above the excluder. If worker bees won’t pass though the queen excluder, the brood chamber will become honey bound, overcrowded, and bees could swarm. Often the queen will remain in the lower two brood chambers anyway if you manage the frames so they don’t get honey bound and she always has room to lay eggs. Mouse Guard (optional) — For use in winter. Imirie Shims — (optional) Great for using when feeding pollen patties. Helps prevent swarming by giving bees more space between honey supers. Use underneath inner cover (above last box) to prevent squishing bees when placing inner cover lid. Choose 10 or 8 frame size. Wintering Inner Cover (nice to have) — Provides a frame for winter candy feeding. You can build your own. Metal Frame Rests (L-Shaped) (nice to have) — Protects wood hive bodies frame edges from hive tool damage for long life. Hive Paint: Hive bodies can be stained or painted using latex paint. Allow several days for the paint to dry before adding bees. Inexpensive paint is available at hardware stores in their mismatched color bin. Low odor or low VOC paint is available. NOTE: There are many ways to feed bees. 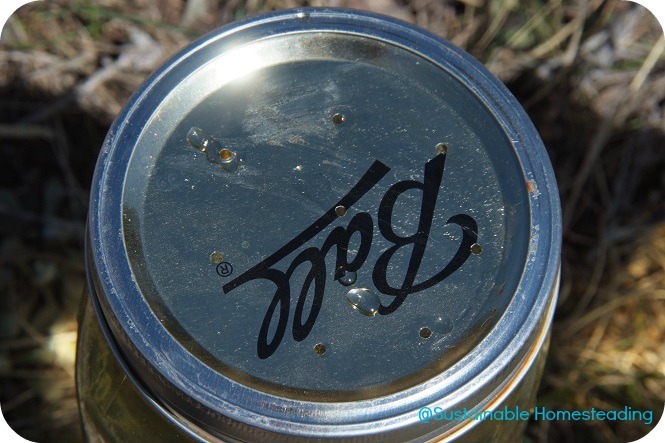 Exterior feeders (often included in beginning bee hive kits) are not recommended. They attract wasps and bees may be reluctant to use them if weather is cold. Mason jar method: Mason jars with lids and rings (punch holes in lids with a tiny nail). 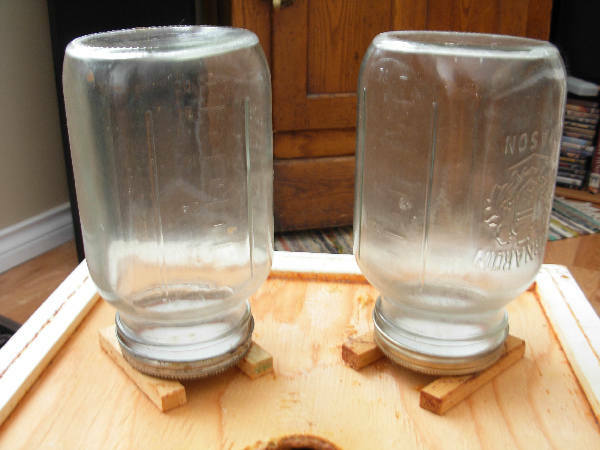 Use square dowels/wood stakes to have multiple mason jars elevated up so bees can get under the jars to feed on sugar syrup. NOTE: Whether or not to medicate your bees is a personal choice. Bee Diseases are covered in Chapters 8 & 9 of the Apprentice Handbook.